This picture was taken by AL Campbell as the fire started. The firefighters are waiting for water before battling the blaze. Scanned from the Cape May County Herald. Castle Dracula caught on fire on Wednesday, January 16th, 2002 at 10:40 am. Two juveniles, ages 15 and 16 at that time, were charged with burglary, arson, and criminal mischief after they confessed to starting the fire. Wildwood Police Officer Jon Winsett was the first to call in the fire, at around 10:45 am. He also apprehended the two juveniles as he witnessed them running from the scene. According to Winsett, he handcuffed them together and then to a pole until he could secure the scene. Wildwood Fire Chief Conrad Johnson reported that more than 100 firefighters from around the region were on hand to fight the fire. 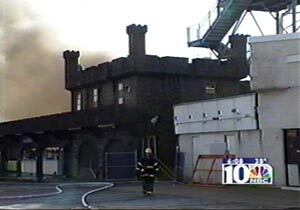 Black smoke poured toward the Boardwalk on a west wind as flames rose 40 feet above the castle's roof. 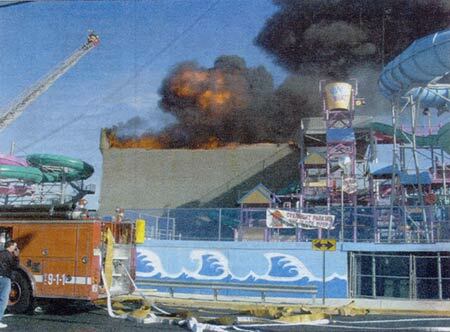 Firefighters soaked surrounding structures on the Boardwalk to prevent the fire from spreading. Firefighter Ernie Troianno III sprays water onto the roof of Castle Dracula. Picture taken by Bill MacQueen and scanned from The Wildwood Leader. By all accounts the fire erupted suddenly and burned quickly. By 10:45 am, fire crews were on the scene setting up equipment. The roof of the building was already engulfed in flames. The roof collapsed at 10:55. At 11:00 am, power lines to the building were cut to prevent an electrical fire. By 11:05, the top portion of the south wall had caved in. 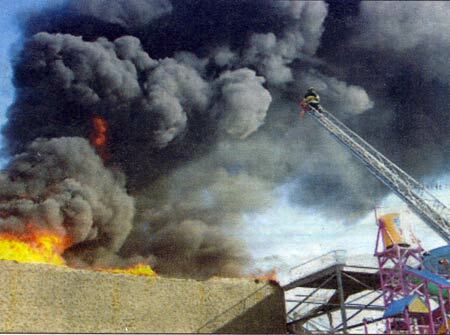 The west wall collapsed around 11:30 and the rest of the structure shortly thereafter. The castle was made of carved stucco over a wood frame and filled with fiberglass figures, which contributed to the heat and the speed at which the fire progressed. The fire was deemed under control by 1:00 pm that day, but firefighters stayed on the scene until early Thursday morning monitoring the smoking ruins. Mike Bukowski sent us this recording of a fire report from Philadelphia's NBC10 11:00 pm news. This news report aired on January 16th, 2002 and features a lot of footage from the fire and an interview with Angelo Nickels. The clip is over two minutes long and is in Windows Media Player format. Below are a variety of pictures we took after the fire. Click on one of the thumbnails to see a larger image. The juveniles that started the fire were students from Wildwood High School who were playing hooky from school that day. According to their confession, they broke into the rear of the castle and worked their way to the front. Because there was no power in the castle during the winter, they lit torches made from old rags and aerosol cans to help them see through the dark. The torches caught fire to the castle and eventually engulfed it in a matter of minutes. They ran from the castle after they realized the fire was out of control. In April of 2002, the teens were sentenced to three years' probation and other penalties for starting the fire. These penalties included 90 days of community service, participation in the Fire Hawks program operated by the county Fire Marshal's Office, their continued attendance to family counseling sessions, and to write an essay apologizing for their actions, describing what they did and its implications. The boys also had to pay $2,500 to the state Violent Crime Compensation Bureau, and could have no contact with each other for the length of their probation. The location where Castle Dracula once stood. 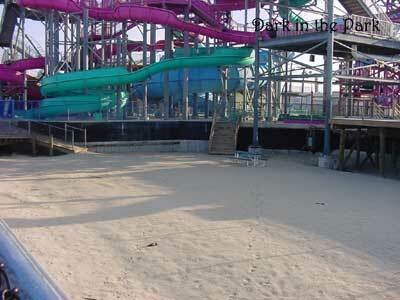 It is nothing but sand and a picnic bench. During the last two seasons, a trampoline ride was erected in this space. After the fire, the Nickels family made public statements declaring that they would rebuild Castle Dracula for the following season. Because of a variety of reasons, including money, zoning problems, and the public image of horror rides, the castle was never rebuilt. The spot where the castle resided for 25 years is just an open lot with trampolines during the season. We can only hope that some type of substantial attraction will be built there in the near future. © 2003 Dark in the Park. This site was created by Bill and Seph Cherkasky.